There’s a great deal more to this easy-to-grow vegetable than the tinned product you find on supermarket shelves – a commercial equivalent of boiling, slicing and submerging beetroot in a vinegar and sugar solution, a process that drowns its mellow, earthy flavour. This versatile vegetable makes wonderful soup, such as the rich, spicy borsch in winter and lighter chilled versions for summer, and they are also delicious roasted. You can boil or steam baby beets and serve hot or cold with a light dressing. They’re delectable grated raw in salads, and leaves are also nice added to salads and stir-fries. If you end up with an over-supply, preserve with spices, vinegar and sugar syrup or make chutney. Beetroot is as close to foolproof as any home-grown crop gets, providing you attend to the basics. It’s not disease-proof – it can get leafminer, mildew and leaf spotting fungi – but you still get rich red tubers. Choose a sunny, free-draining spot and work in well-rotted compost and loosen soil before sowing (some garden centres have beetroot plants available as seedlings). Ideally sow after a green manure crop or a green leafy one such as lettuces (but not after silver-beet, a very close relative). 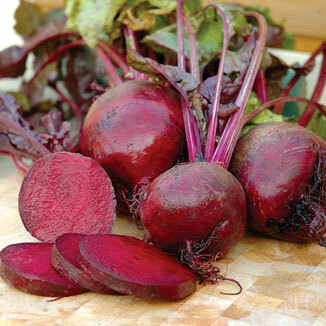 Beetroot likes a near neutral soil, so add lime though well before sowing as beetroot resents fresh lime. Fresh manure, such as sheep pellets, helps plants really whizz along. Start sowing in early spring, and for best results sow where it is to grow. Sowing every three to four weeks will ensure a steady supply of fresh beetroot. Sow seed about 12mm deep in rows or blocks. Seed germinates readily and reliably but for a quick and even start, give ground a good soaking straight after sowing, or soak seed in tepid water for an hour or two. Firm soil well with your hand or a rake after sowing, and keep lightly moist until seedlings appear – usually in about two weeks. Beetroot needs adequate soil moisture so water plants in dry periods to keep them growing. Harvest by using a fork to loosen soil around the beetroot when lifting, and store in a cool dark place, leaving stalks on until you’re ready to cook. A wide range of beetroot types are available. Round tubers, such as the popular and reliable ‘Detroit Red’ and ‘Derwent Globe’ are good for quick spring crops and harvesting as baby beets. Long tubers, which are similar to a carrot, are best if you want crops that give even slices or are easy to grate. ‘Cylindra’ is a popular long tuber type. For those looking for something a bit different try ‘Bulls Blood’, an heirloom variety with stunning dark red leaves and striped roots. Beetroot comes in yellow as well, like ‘Golden Globe’, which doesn’t bleed like its red sisters, and there are also white varieties. You can buy different coloured alternatives from specialist mail order seed suppliers like Kings Seeds or in Niche Seeds’ Beetroot Gourmet Colour Selection at some garden centres.